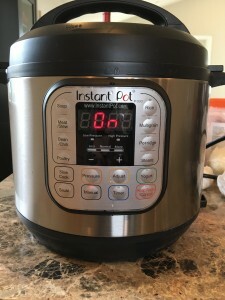 I got my mom an Instant Pot for Christmas and oh my word its the best thing ever! 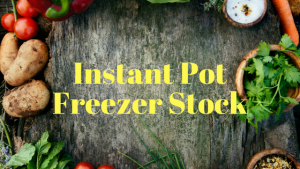 We have been using this amazing pot to stock our freezers with foods we use often. This time we did chicken breasts, ground beef, beans, and tomato sauce. All of this took us a total of about 2.5 hours total including clean up and bagging. 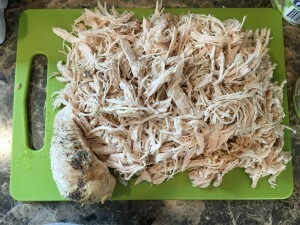 We used 4 pounds of chicken breasts to make about 3 freezer bags of shredded chicken. You could measure out the shredded chicken into the bags we just eye ball it. Next put the breast into the pot with salt and pepper and about 1 cup of broth or water. By not seasoning this a lot we can use it in anything. It usually takes about 25 minutes to cook. Once done cooking and the pressure has normalized take the chicken out and let cool. Shred. We cooked the beef from frozen. I always forget to take meat out. This might be the coolest thing about this pot you can cook from frozen. 3 pounds frozen beef. Use the trivet so it cooks evenly. Add 1 cup water. This is important use the manual setting and set for 25 minutes. After the time quick release the steam carefully. Check meat if its still frozen or red add reseal and set for 5 minutes. We had to do this twice. Once done remove from pot and break up using a wooden spoon. I forgot to take a picture of the beef but its beef its not pretty. My mom and I both like using dry beans but soaking and cooking them is time consuming and they don’t always turn out. Enter the Instant Pot you don’t have to soak the beans. Add the dried beans to the pot cover with water. Set for 20 minutes. After the steam has released you can drain the beans or keep them in some liquid whatever you prefer. Remember is that dried beans double in size so only fill about half full including water. They smell so good and turn out perfect. We got about 4 bags of sauce to freeze out of this batch. We used 4) 28 ounces cans of crushed tomatoes, 2 onions diced, 5 cloves of garlic minced ( we like garlic use what you want), salt and about 2 cups of vegetable broth. Saute the onions and garlic in the Instant Pot (there is a setting for it) add in the tomatoes and broth. Cook on high for about 13 minutes. Once the sauce has cooled you can immersion blend or keep it chunkier. I double bag the sauce its heavier then the rest. My house smelled like sauce had been simmering all day it was amazing! Again I forgot to take a picture. We keep these pretty generic so we can add whatever seasonings we want when we are using it. The chicken and beef will probably be used of tacos, added to the tomato sauce for spaghetti, or to top salads. The beans will be used in similar ways salads, tacos, or soups. The sauce can be made into enchilada sauce, spaghetti sauce, or used as a base for soup. Its great to have food on hand in the freezer that could finish a meal in no time or when things just get busy. Lastly, a few tips and tricks. Remember to label your freezer bags with names and dates. Freeze bags lying on their side so they are flat. This will take up less room in your freezer.